Everybody can benefit from Pilates. This is especially so when the routines are customized to meet each client’s specific needs and goals. I found the Pilates method after many years of living with back pain caused by Scoliosis and by two pregnancies. I had also suffered from chronic shoulder pain after years of playing competitive tennis. 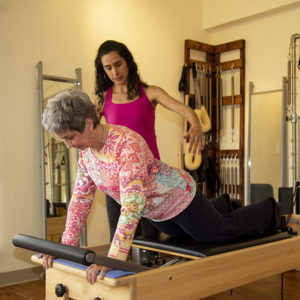 I can confidently say that the specialized routines I received from my Pilates instructor and my dedication to the method has allowed me to continue to be as active as ever without pain. Now I want to do the same for my own clients. Throughout the years, I’ve designed personalized routines for clients with various physical ailments. There is no one series of exercises that are right for everyone. Our specific bodies and physical limitations require a routine designed by an experienced trainer. The Pilates Method has been shown to be beneficial as part of the treatment for Osteoporosis. Modified routines can help clients increase their mobility and bone density. I am a Peer Educator for American Bone Health and I am committed to fighting Osteoporosis. Staying active during pregnancy is proven to be extremely beneficial for the mom and the baby for a healthy delivery. However, being aware of the body changes during pregnancy is incredibly important to keep mom injury and pain-free. I provide a Pilates program that considers all these changes and encourages moms to move safely and enjoy their pregnancies while being active. A lot of new moms start working out without considering the changes in their abdominal muscles and pelvic floor and, unfortunately, end up getting hurt. I teach Postpartum Pilates knowing I help women get in shape by strengthening their core and alignment in a very safe way. I have designed specialized programs for clients with Parkinson’s disease with a focus on increasing balance, coordination and mobility. Simple routine exercises done at home and at the studio can make a big difference in maintaining an independent and active life. I truly believe that Pilates is a great compliment for athletes, both for helping in the healing of sports injuries and for improving core strength and range of motion. Each sport requires the use of specific muscles. A specialized Pilates routine can help focus on just those areas that are important to an athlete’s specific sport. 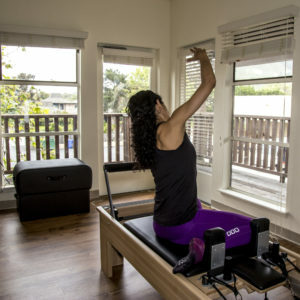 Visit me at Carmel flow Pilates and let’s talk about your wellness goals and the customized routine that Carmel Flow Pilates a unique movement experience will help you achieve them. Better yet, come and visit.